Dermot Creane, founder of Allbridge Capital and InvoiceX, weighs in on the findings of Australia's recent Royal Commission into the misconduct of large banks. So the final report of the Royal Commission into Misconduct in Banking has been published. Australian SMEs / Small to Medium Sized Businesses didn't get much. 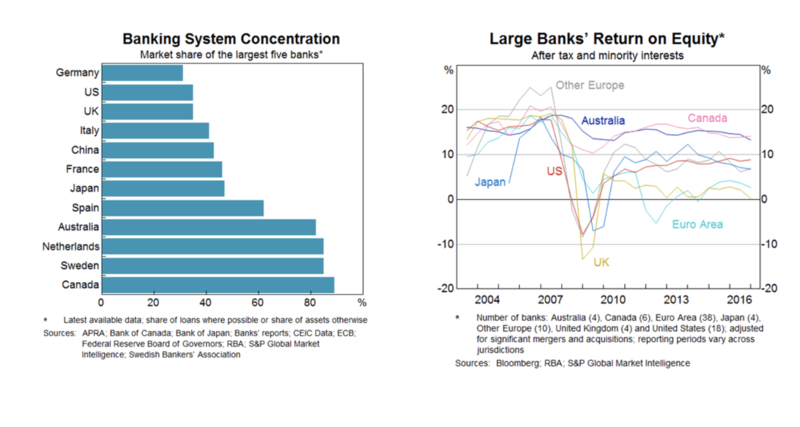 Big 4 Bank share prices popped, adding over $20bn to their combined market capitalisations. They will save a fortune on broker commissions. Remediation penalties were already priced in. Executive option schemes are worth much more now than before the report came out. Our Big 4 Banks run a well protected oligopoly, leveraging their equity at levels that can’t be touched by other lenders (ex-Macquarie), generating returns for shareholders and executives that are the envy of bankers around the world. 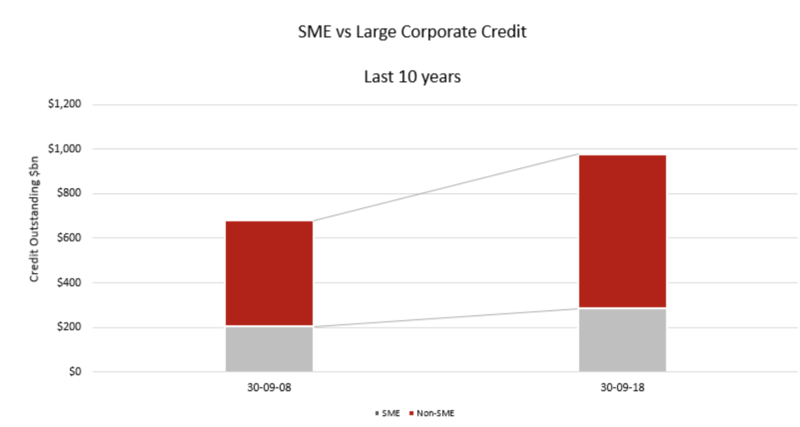 Smaller SMEs really do need stronger credit protection but this was not recommended. No additional credit protections were recommended for Smaller SMEs even though they are clearly no more financially literate than consumers. It is wrong to badge all SMEs as financially sophisticated and for lending to SMEs to be largely unregulated on that basis. We don’t buy the argument that costs would increase. In the sub-$100k quick unsecured loan market, costs are already high. In 2008, COAG agreed to a two phase reform process for the regulation of credit and that in Phase Two the Commonwealth would consider the need to change the definition of regulated credit, and to address practices and forms of contracts that were not subject to the Credit Act. 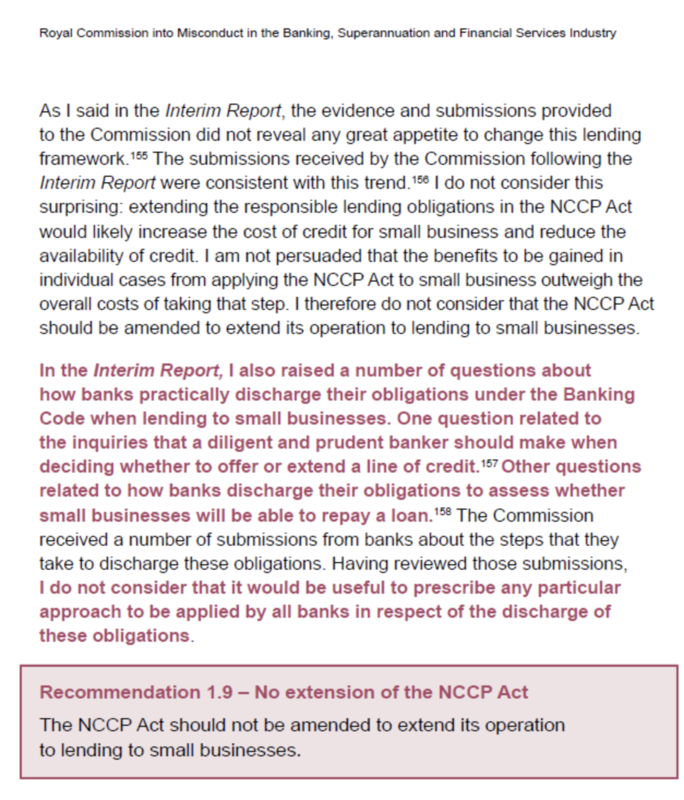 After lengthy consultation, on 21 December 2012, the Minister for Financial Services and Superannuation, Bill Shorten, released for public consultation draft legislation to address perceived gaps in existing credit regulation and enforcement. "A review of the provision of credit to small business has shown that, while the majority of small business lenders and brokers provide a valuable service, some practices exist that result in high financial losses to small business borrowers. 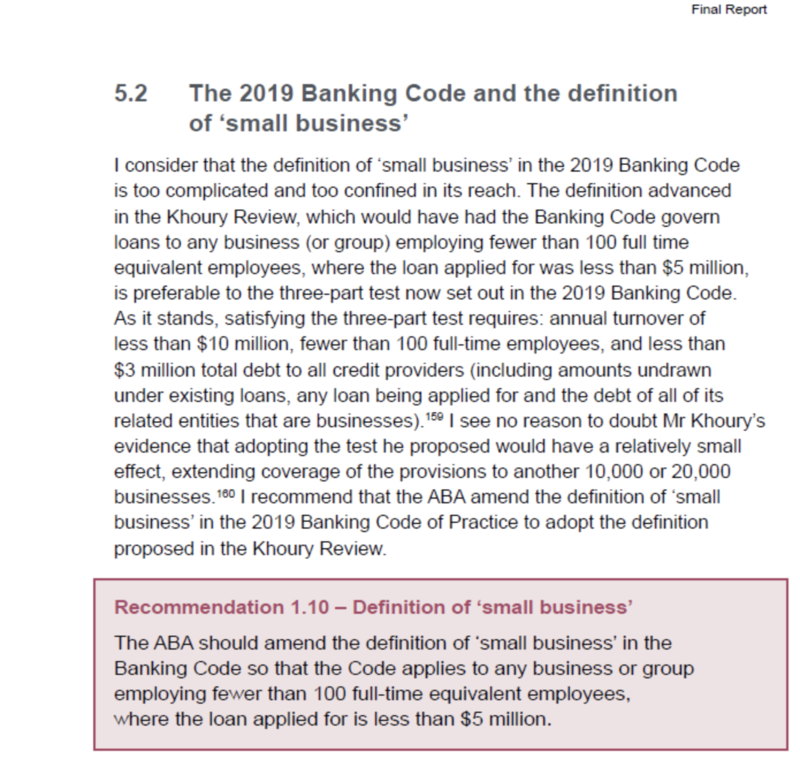 The draft legislation seeks to strengthen protections for small business borrowers, in particular where the loan in secured against the family home, including by extending the Australian Securities and Investments Commission’s supervision and enforcement ability." In typical “Yes Minister” style, after many detailed contributions, the consultation was kicked into the long grass because another inquiry, the Financial Systems Inquiry, had started. "Targeted regulation would be introduced through a negative licensing scheme, improved disclosure requirements, universal access to external dispute resolution (EDR) and the introduction of a remedy for asset-stripping conduct. Back to the Final Report of the Royal Commission. Now perhaps recent and welcome ASBFEO enforced changes to the Banking Code have achieved some of what was targeted in this legislation. 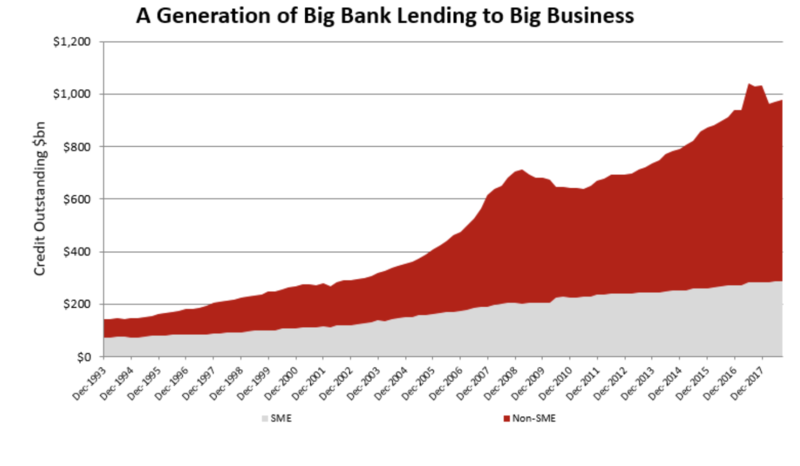 We suspect not enough and certainly not in the non-bank lending sector, the only area of SME finance that is actually growing at a meaningful pace. The non-Fintech non-bank sector is substantial and off radar. At least Fintech is seeing some tightening up in disclosure standards but there is much more to do. The Banking Code does not apply though. "The history of industry standards and codes is not brilliant, frankly. They tend to get put together in great waves of enthusiasm, then sit on shelves. Things go wrong and they are pulled down." Most Australians work in an SME business - 7.2 million of us, 2 out of every 3 jobs in business. It is important that smaller, privately owned businesses prosper. Large corporates get too much attention in Canberra - most of them are cutting jobs in large numbers as automation is deployed. Since 2007, over 78% of Business Lending in Australia has been to the Big End of Town. Most SMEs find finance really difficult, opaque and confusing. Most accountants are ill-equipped to help. We would love to see a free Government sponsored/enabled financial health check app made available to SMEs. Available once a year for free – there could even be a small refund on your tax or some other small nudge-type incentive to encourage use by SMEs or at least their accountants. A free credit report with some standard explanations, a listing of your PPSR regos, an ASIC print-out. It would be fairly easy to do. It would help transform SMEs’ awareness of their financial position. It could then link to ASBFEO guides on finance, an APR checker app etc. But like the proposed COAG reforms announced over 10 years ago, we doubt much will happen sadly. Final Score: Big Banks 4, SMEs 0. For now.